It was a steaming July day in 1920 when Laura Curie Allee got a call from the headquarters of the National American Woman’s Suffrage Association, soon to be the League of Women Voters, asking her for help in getting the 36th and last state, Tennessee, to ratify the 19th amendment. Soon, she, Miss Mary Olcott and Mrs. James Stokes headed for Ohio to convince U.S. Senator Warren G. Harding, who was running for president, to get neighboring Tennessee to vote for the amendment. At Harding’s office, Miss Olcott was their spokesman and her strong personality apparently led to a clash with a Harding aide, who soon told them to leave the office. But after they had departed, Mrs. Allee realized she had forgotten her gloves and went back to retrieve them. The aide, who had apparently calmed down, looked at her and asked why they had come to see the candidate. Mrs. Allee explained. “Why didn’t you just say so?” the aide said, adding that she should never have let Miss Olcott do the speaking. Mrs. Allee said later. The group explained their mission convincingly and, on July 21, Senator Harding announced that he was urging Tennessee to ratify the Amendment. Tennessee did so Aug. 26, and three months later, Mr. Harding was elected president of the United States – with a plurality that no doubt included three newly enfranchised Ridgefield women. 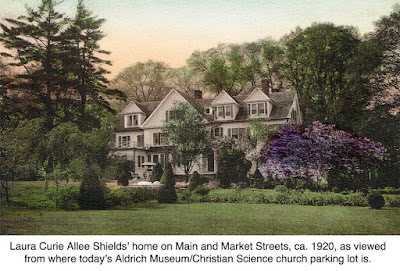 Mrs. Allee and her husband, Dr. William H. Allee, moved to town in 1906 and lived in the house they called Homeland at the corner of Main and Market Streets. The place had been the Hurlbutt homestead and included Hurlbutt’s meat market on Market Street. 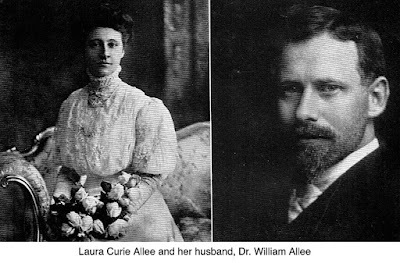 Dr. Allee, who practiced in Wilton, was a leader in improving Ridgefield schools. He was also active in procuring the vote for women (one clever example of which will be described in his profile). He died in 1929. 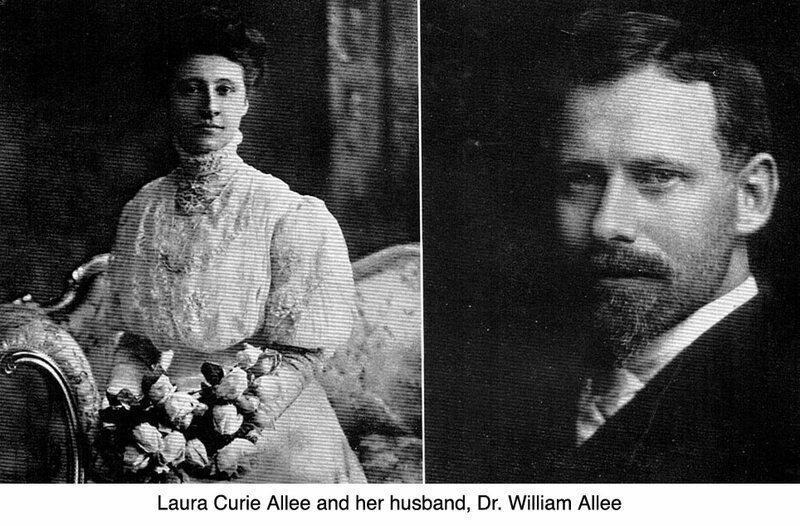 In 1933, Laura married James Van Allen Shields (1871-1954), a patent lawyer who was involved in the music recording industry in its early days. Throughout her life Laura Shields was active in the support of schools, the League of Women Voters, and other community organizations, and helped in the effort to acquire the Keeler Tavern. She also wrote a 353-page autobiography, called “Memories,” self-published in 1940. She died in 1968 at the age of 97 and is buried in Paterson, N.J., alongside her first husband.